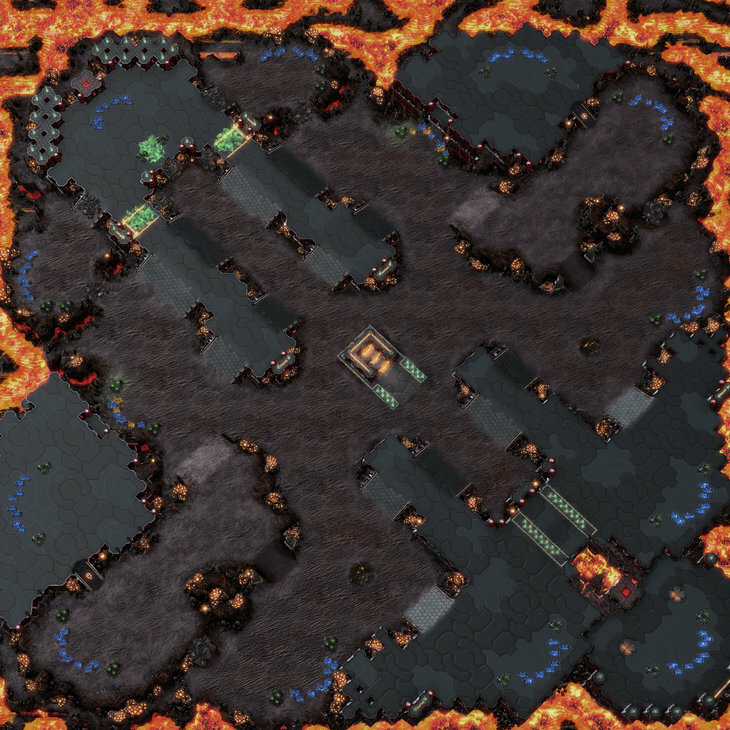 So, after checking Sol Dios by Sunshine and wondering how i could make an entire map work around the feedback i gave Sunshine (The collapsible towers erasing minerals/gas) without falling into gimmicks i came up with this layout. This map was done and textured in a period of two and a half days, but beware that does not mean that is a bad map! I accelerated the process just to be part of the current MotM contest. Making a map in a ~2 day period is something pretty big/incredible to me because i usually take weeks to do so! 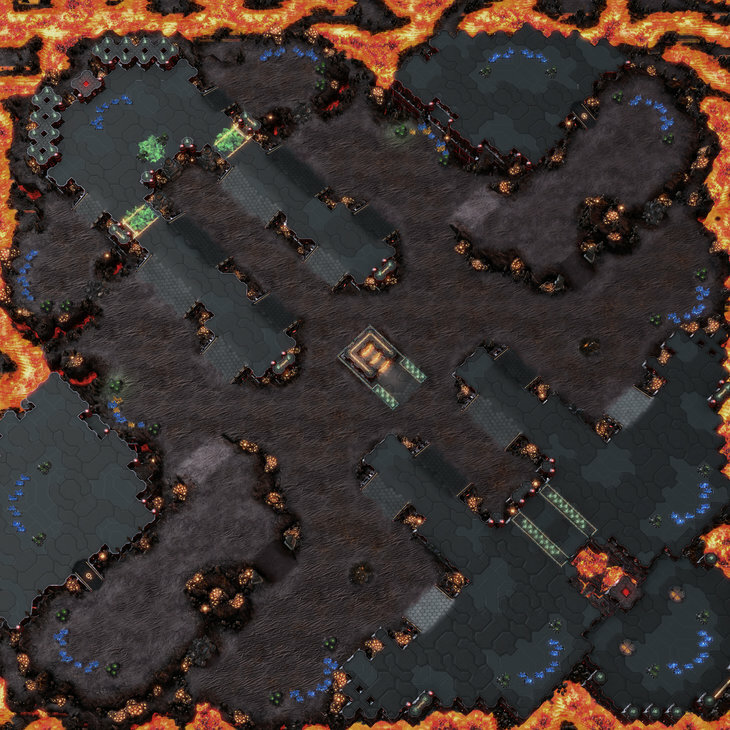 I really enjoyed making this map mostly because this kind of symmetry allows me to play around with some ideas i have been messing around with a lot lately, positional play and such, i also haven't worked with volcanic tilesets in a good while so it's nice to mess around with them ^^. Now I hope you guys enjoy the map as much as i enjoyed making it, hfhf! ◙ North West expansions locked by rocks. ◙ Central High grounds are vital to control the pace of the game. ◙ Forward third base has a nonstandard amount of resources, 4Blue+3Gold mineral patches with 1 Rich vespene geyser (exposed) and 1 normal vespene geyser. ◙ Safe third base can be harassed from the high ground where the forth is located. ◙ Semi-island South East expansion. Removed rocks that lead to the North-West top base. Removed Lava beach splash to try and fix FPS issues. Fixed central doodads so players can see them move through the fog of war. One thing to note, given then absurdly tight time frame, this map has basically zero testing with competitive players (~mid/high masters), so if you want to test it with your friends and then post the replays here go ahead, i don't care if you are gold or silver player (or bronze! ), i always have fun watching other people play in my maps! Center seems a bit tight but that's probably balanced by there being so many attack paths. I think he means in the terrain, like the center of the bottom/right quadrant or the two in the upper left quadrant. I am terran, with really on/off macro, I am in currently playing in platinum. If anyone would like to test this map out feel free to message me, I would enjoy playing a few games on it. Will post replays for you if anyone plays. Glaf you liked the map kiaph, sadly i need to reword some stuff because of FPS drops, i was very worried this would happen because of some decorations, but the lava of the map is actually the one generating the FPS drops so i'll need to see what i can do about that.